I’m a long-time user of TweetDeck, believe it or not. TweetDeck is one of the Twitter clients I’ve been using the most over the years. TweetDeck is only surpassed by Tweetbot on iOS. But my Mac’s main Twitter client is, and has been, TweetDeck for a very long time. TweetDeck is the most powerful Twitter client I found. The one Twitter client that is only better than TweetDeck is Hootsuite, but Hootsuite also adds such a lot of bloat, that it’s no fun to use anymore. TweetDeck hits a sweet spot for me, and I’d like to share how I use it in this post with you. TweetDeck’s most unique feature are its columns. Columns can be anything. I have a column for the keyword “mindnode”. A column has multiple settings, but you can have notifications via sound and popup (OS X Notification Center notifications) if you’d like to for every new tweet in a column. I have them off, for most columns though. There are two more columns I especially like and use a lot. One is called “Stuttgart”, simply. This is a (private) Twitter list of all folks I follow and know from the local Stuttgart area. This way I can keep up with the things people are up to here. The second column is also a Twitter list that I named “Plus” - also private. Plus contains all people I don’t want to miss any tweets of. Plus has only a handful (about 10) accounts on it, it’s very limited, and I try to keep it limited. I don’t want to pick out any names but there are some automated accounts in there that I like. Zen Moments and Epic Women for example. There are people in there, too. Home (Zettt): Since this is my main Twitter account, I’d like to see all tweets from people I follow first. Activity: I really really like Twitter’s addition of the “activity” view, compared to the old-style Mentions. Activity not only shows mentions. It also shows “engagement”, like who retweeted something, who favorited a tweet, and who started following. Having one place for all those things is quite handy. In total I have 13 columns at the moment. I short: columns are awesome. 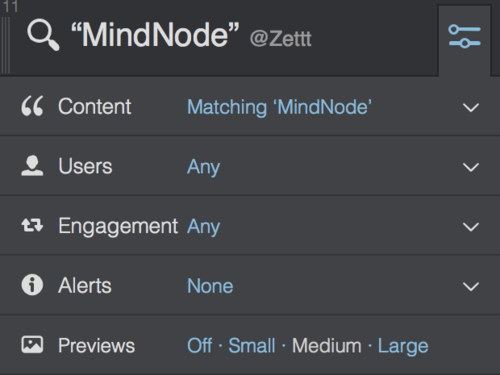 TweetDeck also has scheduling support. You can write a tweet now, and publish it later. Comes in very handy with bitly, and a custom short URL, which, to my surprise, is still possible with TweetDeck. Multi-user compatible: Send a tweet from multiple accounts, favorite, follow, block, report as spam, etc. Mute: TweetDeck can mute tweets based on client, a keyword, or a specific user. Shortcuts (finally): The Mac version has introduced shortcuts. You can move around the interface using the arrow keys, use f to favorite a tweet, s to reveal the search field, n for new tweet, d for new direct message, etc. Use ? to bring up the shortcut sheet. There’s not much I really “dislike”, but to be honest, I wish it were more “native” on OS X. It is clear that TweetDeck, the Mac app available from the Mac App Store, is just a web browser wrapped around the TweetDeck website. I get that. And most of the time it’s irrelevant. There are times though, where I wish it were more native. Those time are rare, and I’m mostly very happy with the app. TweetDeck is my most favorite OS X Twitter client. I use it daily to catch up on stuff quickly. Having my most frequently and important columns right in front when I launch the app is a feature I miss in every other client. You can emulate something similar with YoruFukurou and Twitterrific, but it’s miserable.